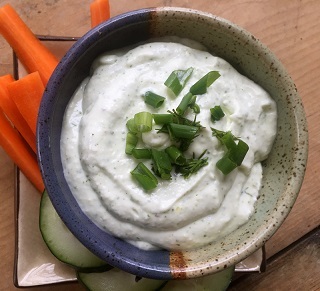 This Vegetable Dip Recipe is a simple blend of spices with dill weed mixed into sour cream and mayonnaise. Some people at the restaurant request this vegetable dip for their chips and as a spread on some artisan breads. 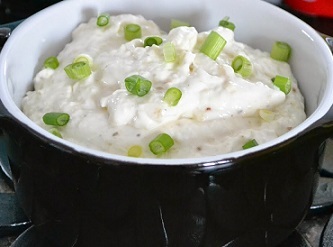 This is really a wonderful dip recipe. Although easy to make, it is really delicious with so many veggies. Serve this with any or all of the veggies suggested or your favorite vegetables or chips. It is even good with potato chips although the dip is a little stiff to use with thin-cut potato chips. People also enjoy this dip recipe with prawns and some other seafood instead of cocktail sauce. But because of its consistency (stiffness) you may want to thin it with just a little heavy cream if you wish to use it specifically with prawns. When serving I often place the serving dish in a larger dish holding some crushed ice to keep the dip cool during parties. Enjoy having your veggies enhanced with this delicious Dip Recipe! Enjoy the company of those you share it with!